A lot of new stuff showed up again this week. We've got color-changing pigment, a mutant USB cable, and some other goodies for you this week. Hello and welcome to the Friday New Product Post where we talk about all the new products we've had since last Friday. We've got some cool stuff this week as always, so check out the video and the list of products. Fun fact, the first time we did the 'has this every happened to you?' was also the first appearance of Dave, back in January 27th, 2011! We're almost to 100 New Product Post videos and we're already recycling old bits. 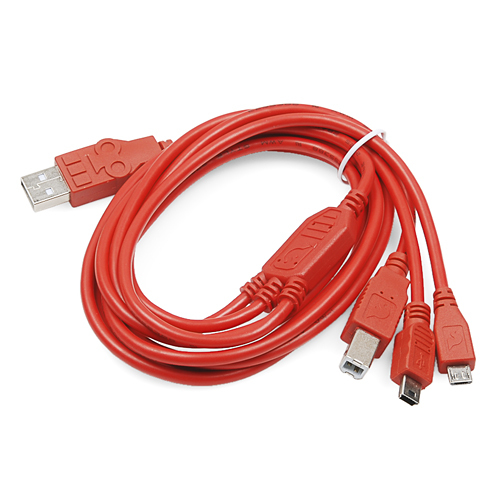 We'd like to proudly introduce the SparkFun Cerberus USB Cable. This 3-headed monster stops you from needing to search for the right USB cable every time you need to connect a board to your computer. One one end is a standard USB A connector, and the other end splits out to a standard B, micro-B, and a mini-B. The cable doesn't act like a hub, so you can only connect one device at a time, but it's still incredibly useful. Color-changing clothing was all the rage back in the '90s, but thermochromatic pigment has many more uses then righteous tees. Make a coffee mug that tells you if your coffee is hot enough or use it to reveal hidden messages. 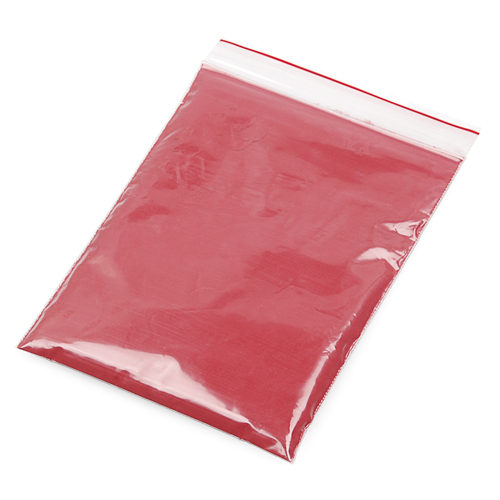 We have thermochromatic pigment in four colors, in 20 gram bags. We have it in black, red, yellow, and blue. Mix it in with your favorite paint (or other materials such as Sugru or Polymorph). When you apply roughly 90 degrees, the pigment will change from it's original color to clear. In addition to the Learn to Solder - BigTime that we introduced last week, we now have the Simon Says version. Just like the BigTime kit, it includes all you need to get started. It includes a soldering iron, some solder, basic tools, the Simon kit, and even some protective (and stylish) eye-wear for those really aggressive soldering sessions. WonderBeeps is a simple little board that decodes sounds (beeps) and turns them into simple commands. Use anything that can produce audio to play the pre-defined beeps, and the WonderBeeps hears them with its integrated microphone and then toggles one of its 16 logic level outputs. There are even simple apps for your phone to easily play these beeps. The MaKey MaKey has been a pretty popular product. But what if you want to use it wirelessly? 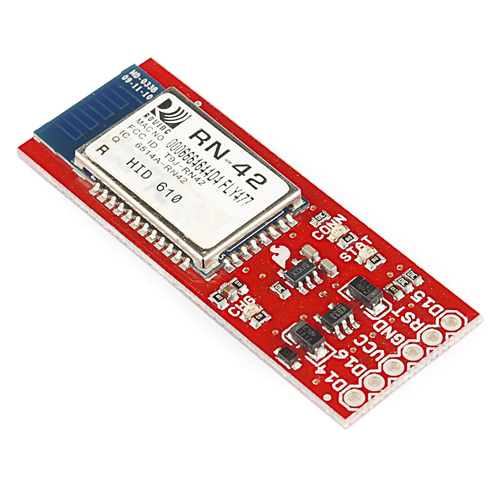 By adding this Bluetooth Add-On board you can easily use your MaKey MaKey as a wireless keyboard. There's even a spot on the back to plug in a battery, which can be charged over USB. 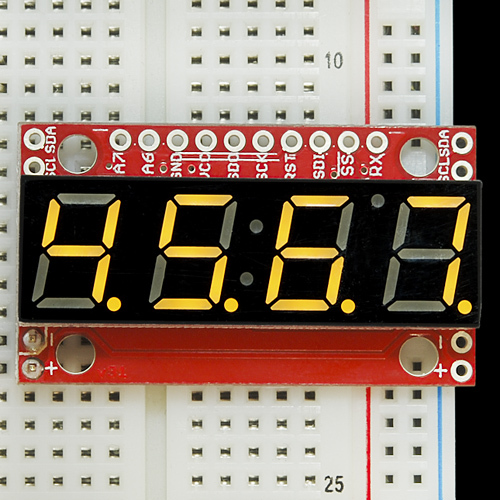 We also have two more 7-segment displays for this week. We've revised our older design to include mounting holes along the side, current limiting resistors and an FTDI header. We just have them in the two colors right now (yellow and blue) but others are coming soon. And lastly, we have a new revision of the BigTime Watch Kit. 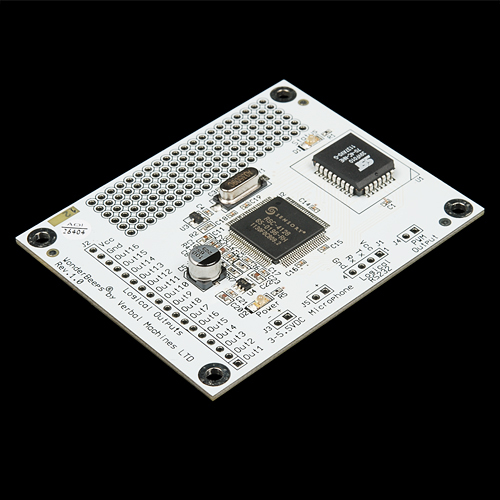 This kit tweaks the PCB and enclosure a bit for a better overall assembly experience. 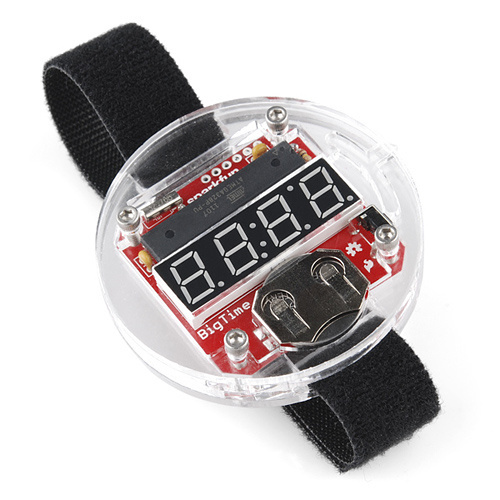 Show off your soldering skills with the BigTime watch! Well, that's all the stuff I've got to talk about for this week. We'll of course be back next week with more new stuff. Until then, happy hacking. It should really be called: "Simon Says, 'Learn to Solder'"
So what would happen if more than one arduino (with different connectors) were plugged in at once, and you tried to upload code to it? And would it all be one COM port or would it show up as multiple? Probably create a rift in the time space continuum. You know end of the world stuff. Or it just wouldn't work at all. Well since I'm able to reply to your comment, I'm going to assume that it just doesn't work.....well, I'm not really assuming it, I'm just relying on Rob......That seems safe right? Yeah, it just wouldn't work. Most likely, it wouldn't show anything hooked up. But you know, give me a minute and I'll tell you what happens. If I don't return, avenge death. Whew, good you are OK. I was getting worried when you didn't post back right away. Oh and Sora62896, I guess you are off the hook for Robert's demise. yeah, I'm still here. you'll have to put up with more puns and silly demos. But as soon as he said it in the video, weren't you wondering too if it would have worked? Feels like just yesterday. Time flies... especially when it's measured on a Big Time! Warning: Do not throw the Big Time watch at co-workers. Is it really safe to charge multiple devices at once through the Cerberus cable? Seems to me that if each of them is drawing 500mA, you end up drawing up to 1.5A, which is more than the port may be able to handle. in production, when we would test boards, sometimes they were bad. sometimes they would try drawing as much current as possible or have shorts, etc. the USB host would just shut down and give an error message in windows telling you too much current was being sourced. it's not really a big deal as the host controller (as Nick said) won't easily allow you to just pull as much juice as you want. Windows? Who uses windows in this day and age? Oh, right, you're testing out things that might fry your system. Windows is indeed the logical choice. Always a sobering reminder of just how bad an experience computing is for most people. I would check the power requirements of the devices you're hooking up and how 'lazy' your USB controller is (How strict it is about what gets 500mA vs. 100mA) but the worst that can happen is your computer shuts down your USB port until you unplug it. I am astonished at Robert's ability to grow a beard. It's almost unnatural! Should the doping commission be alerted here? Hey Bob I see you're letting your beard grow. At this rate you can bleach it and play St. Nick in a few months. there's 0 chance of that happening. I think you for got the 10 before that 0! Yea, video proof that there is solder in the kit! I believe you guys made a mistake in your commercial... Your choice of original laptop would appear to be a Lenovo Thinkpad. You then chose to have your user downgrade to an Apple product. Since you obviously had both of these computer for the video, I suggest dropping each down a flight of stairs to see which one is more durable. Be forewarned, the Apple product will likely develop serious problems with this form of testing. You may not notice any change in the usability or cosmetics of the Thinkpad - this is normal. You mention WonderBeeps having an integrated microphone. But it doesn't. RE: BigTime Watch Kit.- all you would need is to add a GPS and you could have one that auto sets itself. TOO bad the BigTime Watch Kit could not do all that too. Sure it could. Just tack a GPS and an SD socket on there and modify the program running on the microcontroller. On a less who-cares note, the products this week are impressive. Great job selecting things the people can use, and didn't know they wanted. Recycling is good! Even in comedy (to a degree, of course). I've been looking for thermochromatic pigment for a while now! Glad to see that you're carrying it. Have you done any color mixing tests? The Sugru example with the black pigment made it appear the pigment is overpowering. Can you take yellow Sugru and the blue pigment to make a green ball that turns yellow with heat? Or would the blue immediately and totally overpower the yellow? Actually, Dia is the one who made the Sugru ball when we were first playing with the pigment samples. According to her, she actually mixed some pigment into the Sugru and then ROLLED the resulting ball in more pigment to get coverage.